WHEN Kermit Putman was 20, he went from hanging on a North Philly street corner to serving as a U.S. Marine in Panama before and during the 1989 Operation Just Cause invasion that captured the notorious drug-dealing President Manuel Noriega. 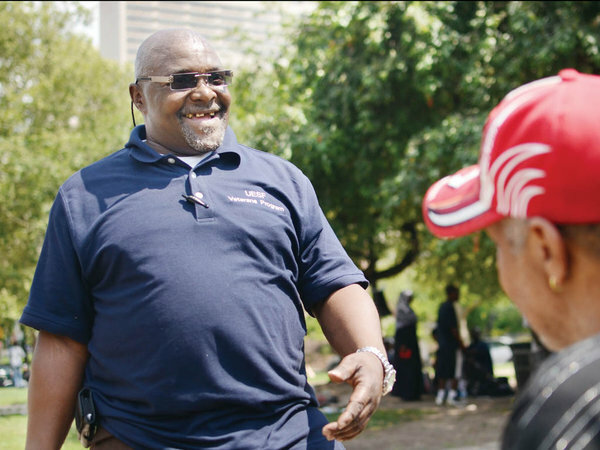 On a recent Sunday afternoon, Putman, now 48, wandered through hundreds of homeless people on the Benjamin Franklin Parkway as church groups served them lunch. Everything about him, from his old clothes to his warm smile, was relaxed – except his eyes, which were as intense as they were back in the day, but focused on a very different target. The trained killer of enemy soldiers has become a trained rescuer of fellow veterans who are living on the streets as strangers in the country they once risked their lives to serve. As the lead veteran-outreach worker for the United Emergency Services Fund, Putman has converted his former search-and-destroy skills into a search-and-rescue mission on the Parkway. Tina Floyd, UESF operations director, said that after the annual single-night count in January, the city’s Office of Supportive Housing found 357 homeless veterans among Philadelphia’s 5,738 homeless people. So, even while Putman is smiling and schmoozing with the homeless when they gather for meals on the Parkway or at Broad Street Ministry, on Broad Street near Pine, his somber eyes give him away. There is no joy in them until he brings a homeless vet off the streets and into a house, a decent job, a reunion with long-lost loved ones. Putman knows how difficult his mission is because before he became a rescuer of lost souls, he was one himself. He worked as a limo driver, made good money, looked sharp in nice clothes but was felled by an enemy from his Panama days. As an infant, long before she knew her father, Putman’s daughter saved his life. One day, as he was leaving the crack house to buy drugs, the pay phone on the street rang and he answered it. “My daughter’s mother said, ‘You got any money?’ ” Putman remembered. “I said, ‘I got $20 and I’m ready to go cop.’ She said the baby needed diapers. He went to detox, then to rehab at Gaudenzia. But in the years that followed, jobs came and went, and Putman, living on the thin line between the working poor and the destitute, drifted in and out of homelessness. He survived in shelters and on the street, stashing clean clothing in hiding spots around the city so that “people never knew I was homeless,” he said. He got a student loan and attended Orleans Technical Institute, in Northeast Philadelphia, studying human services, hoping for a job that would lift him out of poverty. “I’d ride the El end to end, then ride the Nite Owl bus all night until it was 5 a.m. – time to get ready for school,” he said. “School kept me from going off the deep end. Whether it was God or serendipity, Putman was walking through Suburban Station last winter when he met an outreach worker for UESF, an agency that traditionally helped poor people pay housing expenses but had just received a million-dollar federal grant to help homeless veterans find housing and jobs. First, UESF helped Putman. Then, it hired him. “I’m on the Parkway, I’m in the bushes, I’m under I-95 talking to guys sleeping under the girders,” Putman said, as he trained his Marine Corps gaze on the homeless people around him. Thanks to his UESF job, Putman lives in a house in North Philly with an extra bedroom for his daughter, now 16, to stay in when she visits. After so many years of living on the edge, Putman has come home. UESF’s own Kermit Putman with a heart as wide as the sky. Way to go Kermit!